The first local fruit to hit the markets where I live is rhubarb. After a long winter of apples, apples and more apples, it’s refreshing to see something new. 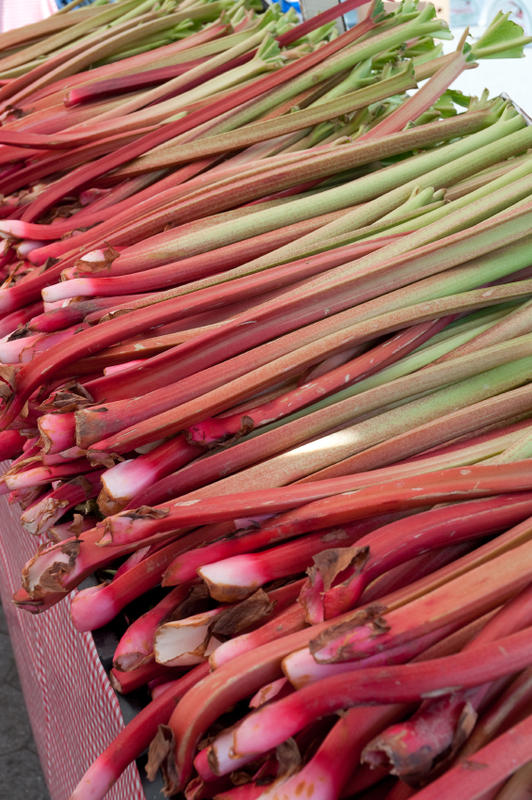 Rhubarb is remarkably versatile and can be used in both sweet and savoury recipes. In desserts, it pairs very well with ginger, vanilla and of course, strawberrries. Cheesecake is always a popular dessert and is a great choice for entertaining because it can be made in advance. It’s also surprisingly easy; don’t be intimidated by the length of the recipe, it’s very simple if you take it step-by-step. Be sure to use a springform pan so you can easily remove and cut the finished cake. Once strawberries come into season, you can always add a few to the rhubarb compote (a compote is basically a sweetened fruit sauce). Try a ratio of half strawberries and half rhubarb and sweeten to taste. The cheesecake base is pretty neutral so you can top with other favourite fruit sauces if desired. In a food processor*, pulse the gingersnaps until they become fine crumbs. (*if you don’t have a food processor, place the cookies in a sturdy bag and crush until fine with a rolling pin or wine bottle). You should have about 1-1/2 cups of crumbs. Place the crumbs into a medium bowl. Melt the butter (it can be done in the microwave in about 45 to 60 seconds). Pour into the gingersnap crumbs and stir until the crumbs are completely coated. Press the crumb-butter mixture into the bottom of the springform pan, making sure it’s in an even layer. Bake the crust for five minutes. Remove from the oven and let cool while preparing the cream cheese filling. With a stand mixer or hand mixer, beat together the cream cheese, sour cream, sugar, vanilla, vanilla bean seeds and salt until smooth. Use a rubber spatula to scrape the sides of the bowl as necessary. Turn the beater speed to low and add the eggs one at a time. Mix until smooth. Tip: Crack the eggs, one at a time, into a separate bowl before adding to the batter to ensure no shell pieces get into the filing. Pour the cream cheese mixture over the crust. Bake the cheesecake at 350 degrees Fahrenheit until just set in the centre, about 40 to 50 minutes. Remove the cheesecake from the oven and let cool slightly. Refrigerate for at least three hours before serving. To serve: Top with rhubarb compote (see recipe, below). Run a knife between the pan and the edge of the cake to loosen it before unhinging the springform pan. Trim any leaves and root ends from the rhubarb and discard. Chop the stalks into 1/2″ chunks. Place the rhubarb pieces into a medium saucepan. Add the water and bring to a gentle simmer on medium heat. Cook until the fruit begins to soften, about 7 to 10 minutes. Add the sugar, salt, ginger and vanilla. Stir to combine and continue to simmer until the rhubarb is completely soft. Use a large spoon or potato masher to crush the fruit. In a cup, add the cornstarch and water and mix well until smooth. Whisk the cornstarch slurry into the rhubarb mixture and turn heat to medium-high. Cook until the mixture begins to thicken, about 5 to 7 minutes. Stir in the butter until melted. Remove from the heat and let the compote cool completely before using. Extra sauce will keep in the fridge for a few days. 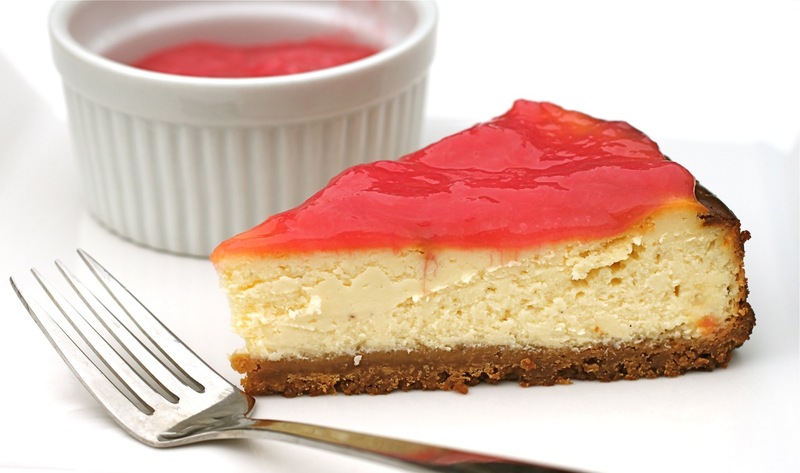 To finish the cheesecake: Spoon the cooled rhubarb compote over the cheesecake, spreading it in an even layer. Serve extra sauce on the side. After a brief hiatus, The Friday Five is back! 4. Everyone is familiar with cereal mascots such as Tony the Tiger and the Sugar Crisp Bear. College Humor imagines what would happen if boring cereals had mascots. I think Cal, the Regular Bowels Owl, sounds like he’d be a hoot. (College Humor). As the weather warms up, many of us are looking for fresh meal ideas. A simple salad of chilled seafood topped with an easy avocado and buttermilk dressing makes an elegant lunch or light dinner. It can also be served in smaller portions as a starter course. 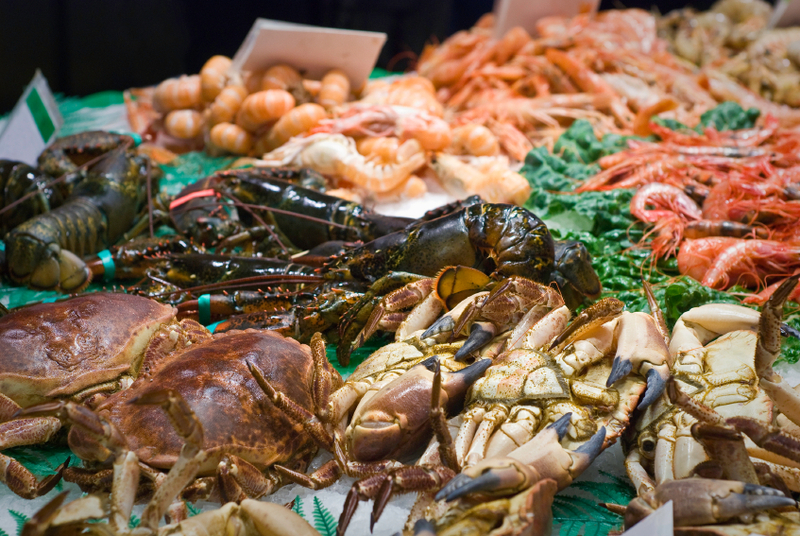 Many fish markets sell lobster, shrimp and crab that have already been cooked which makes this a snap to pull together. Make sure you select an avocado that is very ripe – I often plan ahead and buy my avocados a few days before I need them because the ones at my local store are usually under ripe and as hard as rocks. Traditionally, buttermilk was the liquid that was left after making butter. Today, most buttermilk sold in supermarkets is made by adding lactic acid bacteria culture to pasteurized milk. Buttermilk is tangier tasting and slightly thicker than regular milk. Full-fat and lower-fat options are available in the dairy section of most grocery stores and it is sometimes sold as a powder in the baking section. However, if buttermilk is not available, a decent substitute is to stir one tablespoon of fresh lemon juice into one cup of milk. Let the mixture sit for five minutes and stir until smooth. Sour cream or plain yogurt will also work – mix with a small amount of milk to thin it. Cut the avocado lengthwise through the middle and pull the two halves apart. Remove the pit and discard. Scoop the avocado into the bowl of a food processor or processor cup of a hand blender. Add the garlic, buttermilk, mayonnaise, lemon juice, cider vinegar and two teaspoons of the chives to the avocado. Puree the mixture until smooth. Transfer dressing to a bowl and stir in the remaining chives, diced shallot and season with salt to taste. Use as a dip or dressing. It will keep covered in the fridge for a couple of days. Place a bed of lettuce on each of four salad plates or one big serving plate. Top with cherry tomato halves. 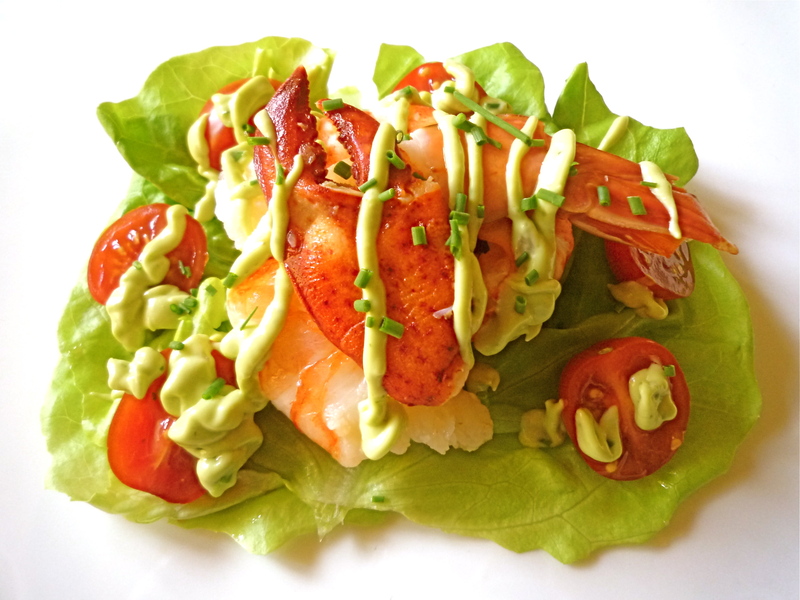 Set cooked seafood on top of the lettuce and tomatoes, arranging it so it looks attractive. Drizzle with avocado-buttermilk vinaigrette and garnish with fresh chopped chives. Copyright Trish Coleman. Please contact the author to obtain permission for republication. This article first appeared on Suite 101.com. Asparagus season is underway and I’m always looking for new ways to use it. Luckily, it’s very versatile and can be a part of breakfast, lunch or dinner. 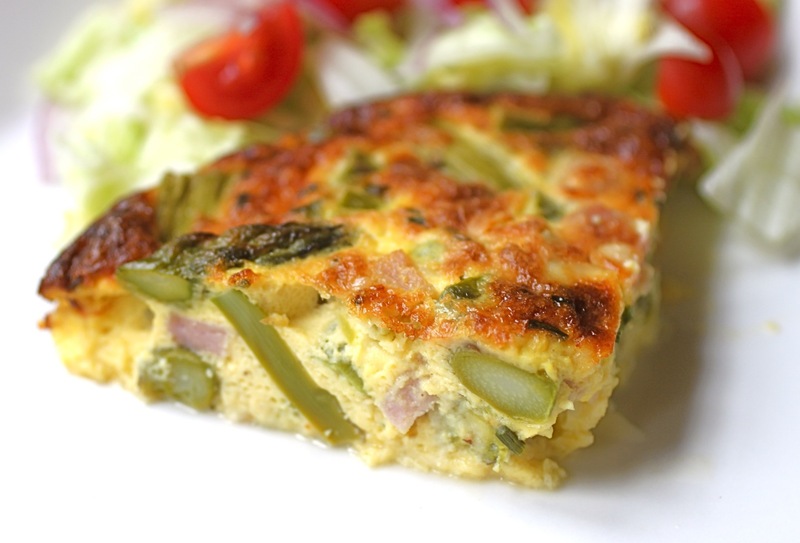 This crustless quiche is perfect for brunch – it can be made in advance and re-heated. Leaving out the crust makes it dead simple to put together (Bonus: it’s also low-carb!). This recipe is very flexible: add a bit of cooked ham or crab, some chopped fresh herbs (chives are nice) and your favourite cheese. I sometimes add a bit of swiss cheese in addition to the cheddar. A tip for removing the slices from the pan: Make sure the pie plate is well greased (including the top rim of the plate) before adding the custard to bake. After removing the baked quiche from the oven, run a knife tip around the edge of the quiche to loosen it from the plate. Let the baked quiche rest for about 15 minutes before slicing and serving. Steam asparagus until just tender, approximately 6 minutes (asparagus can also be boiled in a small amount of water until tender). Remove from heat and set aside to cool (you can also plunge them into a boil of ice water to halt cooking. Dry the spears well before using). In a large bowl, combine eggs, cream, cheese, salt and pepper. Stir until thoroughly mixed. Add cooled asparagus pieces and mix so the spears are evenly distributed. Grease a 9” pie plate with butter. Pour egg mixture into pie plate. Bake for approximately 25 to 30 minutes or until the top of the quiche is brown and puffed. Remove from the oven and let cool for about 15 minutes before serving. Optional: this quiche also pairs well with crab, lobster or ham. Add cooked meat or seafood to the egg mixture before baking. Spring may have officially started back in March but today marks the ‘real’ beginning of spring for me: at long last, the first local asparagus is at the market! 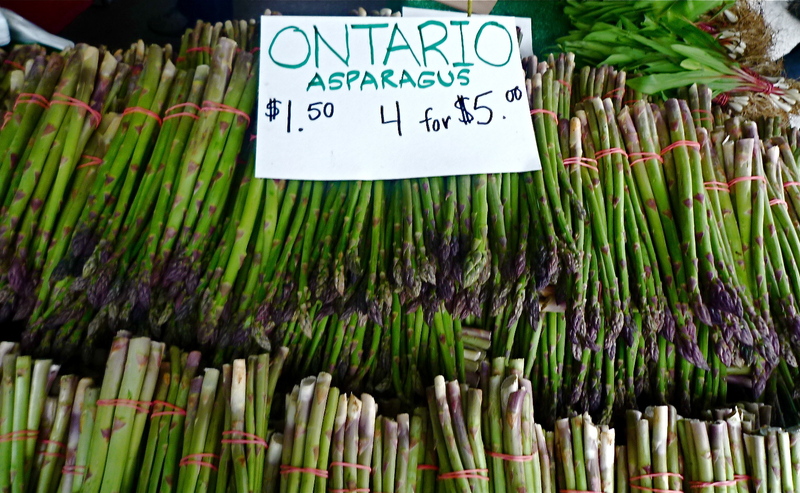 I’ve been waiting patiently for asparagus season to begin and was not disappointed at the St. Lawrence farmers’ market this morning. I also found local fiddleheads, wild leeks and rhubarb so things are starting to get interesting in the kitchen. 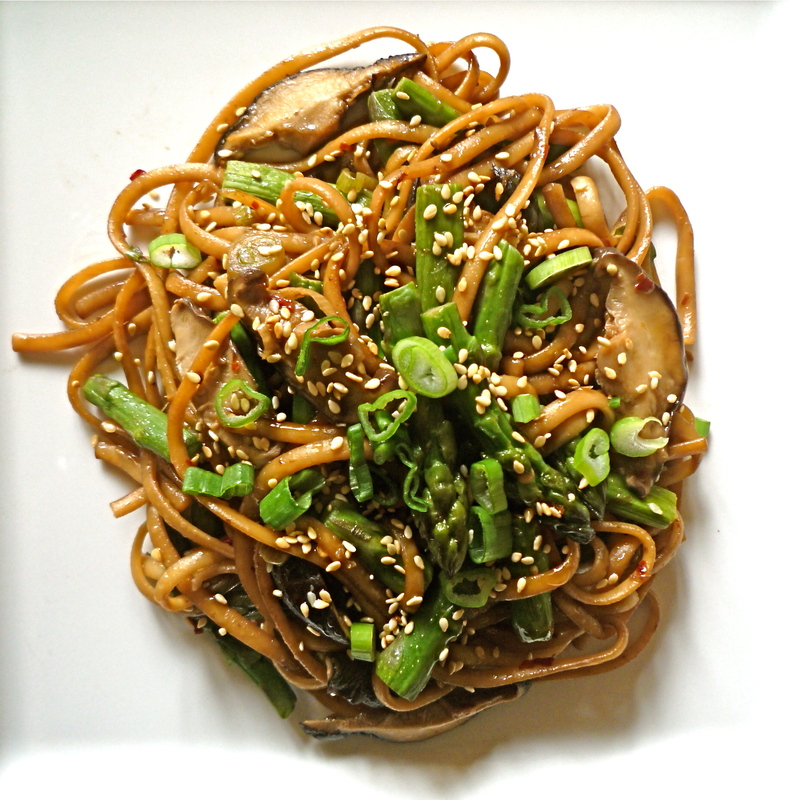 Why not make a delicious and simple Asian-inspired noodle dish to showcase new asparagus? Sesame oil can be found at most supermarkets with the soy sauces. It adds a delicious nutty flavour to dishes and complements the asparagus and mushrooms beautifully (although a little goes a long way so be sure to use a light hand with it!). To make the sauce: In a bowl or large measuring cup, add all sauce ingredients and stir to combine. Set sauce aside until ready to use. Prepare noodles according to package directions (spaghetti and linguine are usually cooked for about 9 to 11 minutes in salted boiling water). While the noodles are cooking, stir fry the vegetables. Heat two tablespoons of neutral oil in a large deep skillet on medium-high heat. Add the asparagus and mushrooms. Stir-fry until the mushrooms have softened and the asparagus is tender-crisp, about 6 minutes. Drain the noodles and add to the skillet with the vegetables. Pour sauce over the mixture and use a large spoon and fork to toss the mixture until vegetables are evenly distributed and the noodles are coated with sauce. Garnish the noodles with toasted sesame seeds and sliced green onions before serving. Additional Ideas: You can make the dish more substantial by adding cooked meat (sliced grilled steak or chicken would be delicious, as would Chinese bbq pork). 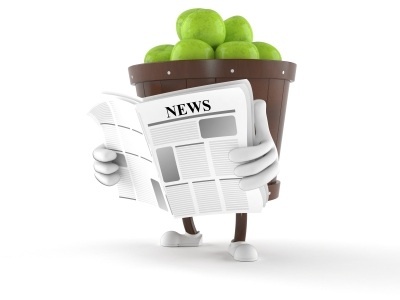 You can also add other vegetables such as snow peas, diced red pepper, steamed broccoli or sliced zucchini. Every now and again something will come to my attention and I’ll become sort of obsessed with it for a while. The current object of my affection is Canadian snow crab. It started with a couple of trips to Montreal I took back in April. The snow crab season had just begun and I enjoyed a starter of cooked, chilled crab at a party I was attending. A couple of weeks later, my husband and I had an excellent meal at Le Filet, a new restaurant from the owners of the much-lauded Le Club Chasse et Pêche. (Lesley Chesterman gave Le Filet a lukewarm review in The Gazette around the same time but the kitchen was on its ‘A’ game the night we were there and our dinner was outstanding). The highlight of our meal was an asparagus and snow crab risotto. When I returned to Toronto, I decided to seek out some of the sweet crustaceans and we’ve enjoyed it a number of times since. 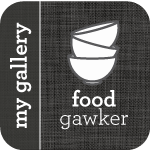 Snow Crab (a.k.a. Queen Crab, Spider Crab, Crabe des Neiges, Crabe Araignée) is harvested off Canada’s east coast from April to November. It is usually found frozen at most fishmongers although last weekend I was fortunate to find cooked, unfrozen claws and legs at The Beach Fish House, a great little seafood shop in my neighbourhood. 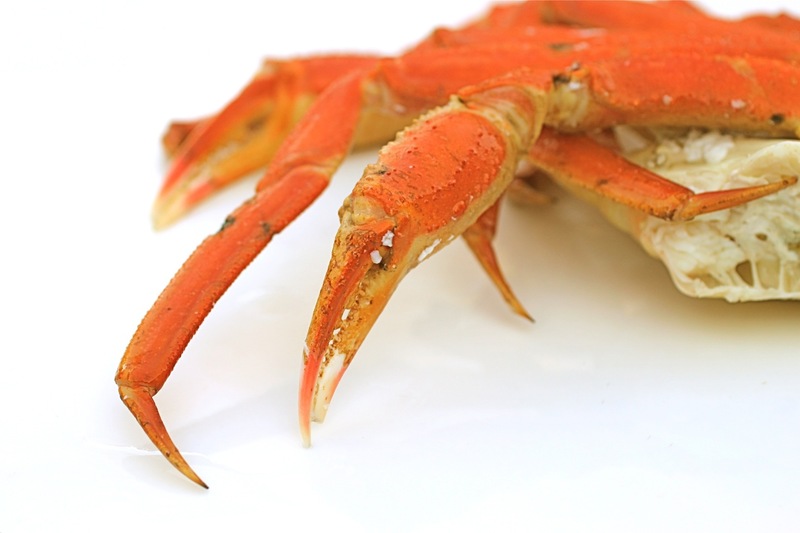 To thaw frozen snow crab, you can steam or briefly boil the legs/claws. Extracting the meat takes a bit of time but is well worth the effort. I usually set the crab on a clean folded dishtowel to soak up any liquid. You can use lobster crackers or a sharp knife to crack open the claws. The shells tend to be relatively thin at this time of year so I use seafood scissors (see photo) to cut them open. Most cookware shops sell seafood forks that you can use to extract the meat but I just use the forks from my fondue set – they work perfectly fine. 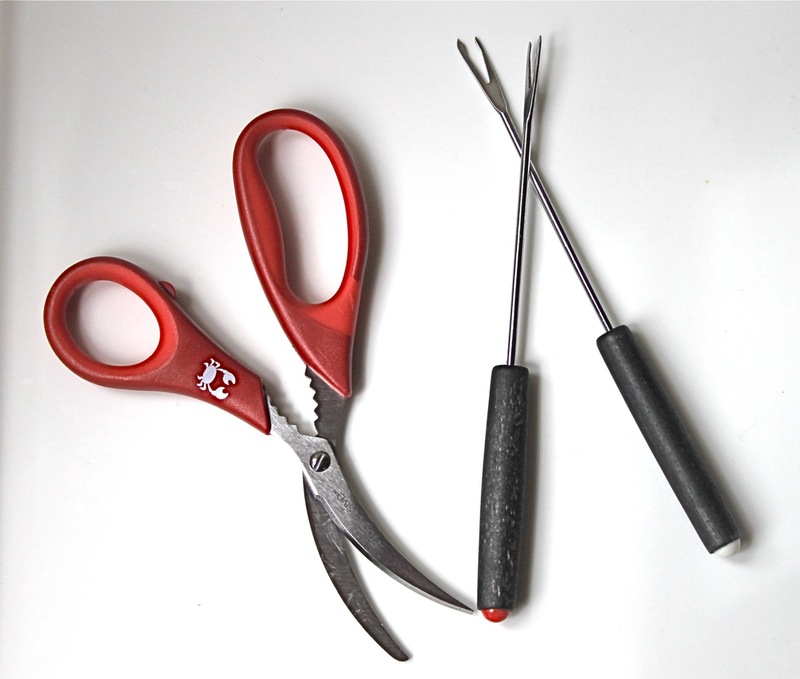 Tools for extracting crab meat: seafood scissors and fondue forks! Melt some butter in a small bowl. Finely mince a clove of garlic and stir it in. Add a squeeze of fresh lemon if desired. Dip the crabmeat into the garlic butter and enjoy! In a sauté pan, heat a few tablespoons of butter or olive oil. Add a teaspoon or so of red pepper flakes, two finely minced garlic cloves, a couple of peeled and seeded diced tomatoes and cook for a minute until the garlic is tender and fragrant (you can also add a bit of minced green onion and finely diced red or yellow pepper if desired). Add a cup of crab meat to the pan and stir to combine. Cook spaghetti or other long pasta according to package directions. Add the cooked pasta to the sauce and toss until the pasta is coated. Season with salt and pepper and garnish with fresh chopped chives, if desired. These make a great appetizer for parties. You can skip the avocado to make things easier. Get the recipe here: Crab and Avocado Stuffed Tomatoes. The perfect spring dish, this was inspired by my dinner at Le Filet in Montreal. Follow the instructions for Basic Risotto but use shellfish stock (see recipe below) instead of meat stock (although chicken stock will work in a pinch). 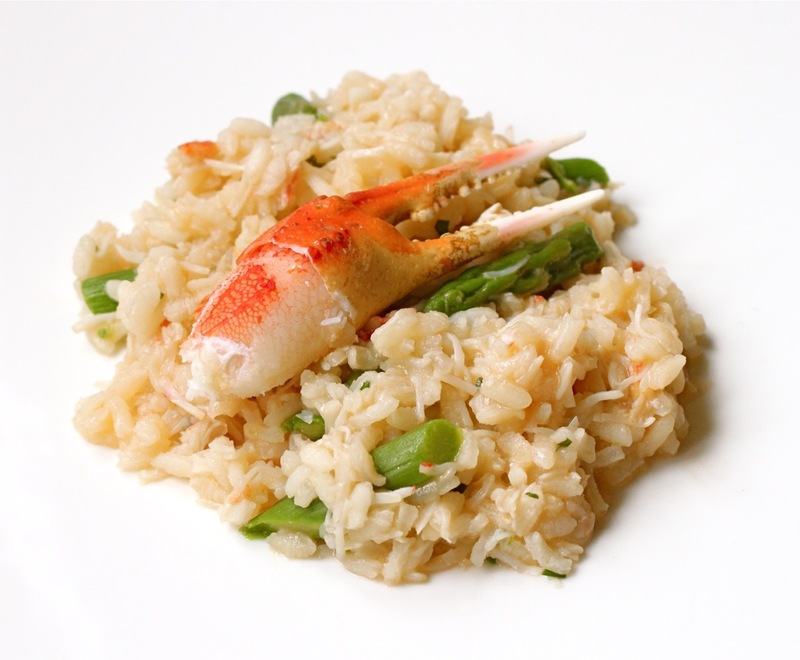 Add about 1-1/2 cups cooked crab meat and 4 oz./113 grams of lightly steamed asparagus, cut into 1-1/2″ pieces. Stir in the asparagus and crab toward the end of cooking. Season with fresh chopped chives and two finely minced fresh basil leaves. Finish with a generous amount of butter and garnish with a crab claw (optional). Note: Italians do not usually serve seafood dishes with cheese but you can add a bit of parmesan if desired. 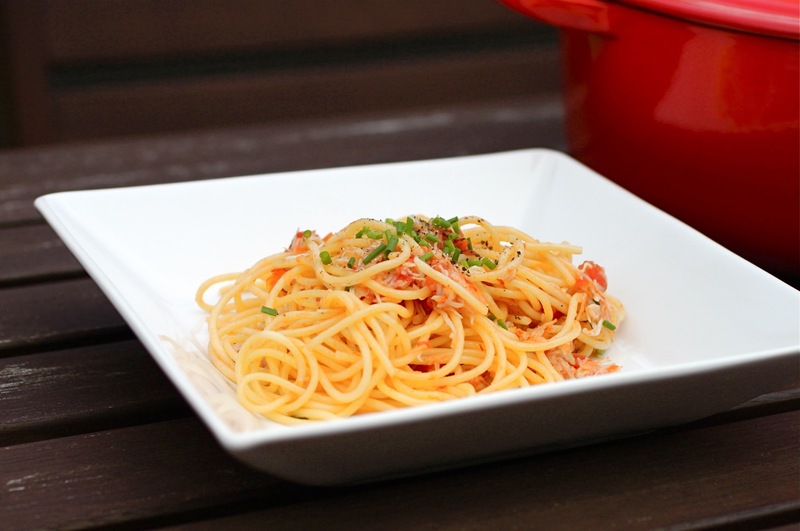 This makes a great base for all kinds of seafood dishes from risotto to pot pie to chowder. I usually save any shells from shrimp, lobster and crab in a bag in the freezer until I have enough to make a batch of stock. Leftover stock can be frozen. In a large stockpot, heat the olive oil on medium-high. Add the shells and sauté until they begin to brown slightly around the edges, stirring frequently (they may stick to the bottom of the pot a bit). Add the onion, carrot and celery and sauté for another two minutes. Stir in the tomato paste and add the brandy, if using. Add the thyme. Pour in the water. Cover and let simmer gently (don’t hard boil) for about 25 minutes. Line a strainer with multiple layers of cheesecloth and pour the stock through it into a large vessel. If the stock isn’t completely clear, repeat the straining with more clean cheesecloth. Stock can be stored in the fridge for a couple of days or frozen. Note: The stock will seem a bit bland because it doesn’t have any salt in it – season it as you use it so you can control the sodium levels. May 5th is Cinco de Mayo, which is a great excuse to enjoy Mexican-inspired food and drinks. A simple roasted tomato salsa makes a delicious accompaniment to many dishes, from quesadillas to tacos. Or, just enjoy it with some tortilla chips and a margarita or Mexican beer. Tomatoes are not in season right now but high quality greenhouse-grown cherry tomatoes are available in the produce section of most grocery stores. I usually use Canadian-grown Savoura brand cherry tomatoes but any kind will do as long as they’re ripe. A quick roast in the oven enhances their sweetness and adds a bit of delicious char. 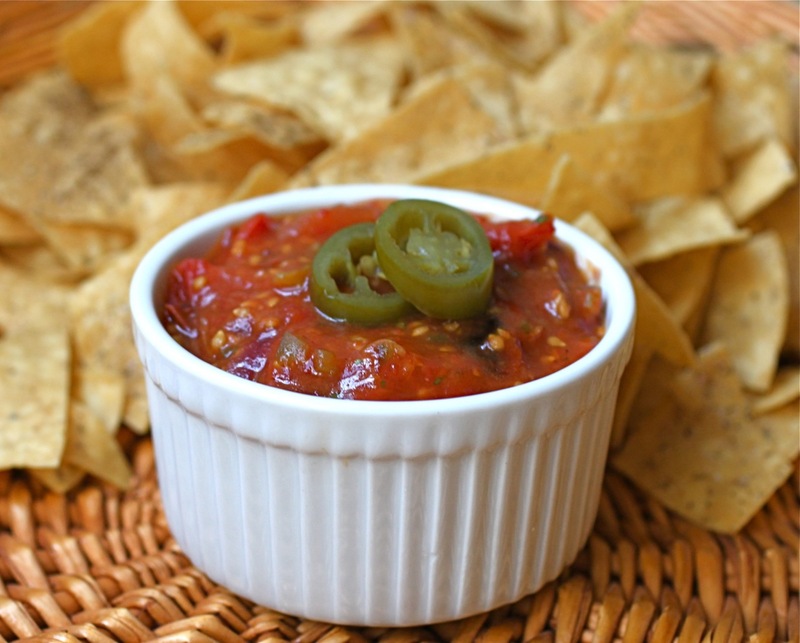 You can add additional jalapenos and hot sauce for a hotter salsa. Serving Suggestion: Why not make some Crispy Fish Tacos and Mango Margaritas? In a large bowl, add the tomatoes and onion chunks. Toss with the oil and a generous pinch of salt until they are coated. Line a rimmed baking sheet with parchment paper. Make sure the paper goes up the sides of the rim so it catches any juices from the tomatoes. Roast the vegetables for 25 minutes or until they are softened and slightly charred. Carefully lift the parchment paper and pour the contents into a large bowl. Let cool completely. Use a spoon to break up the tomatoes and their skins, leaving the sauce slightly chunky. Add the chopped jalapenos, garlic, lime juice, cilantro (if using) and salt to taste. Stir together until smooth. Add additional hot sauce if desired.